iOS app won’t replace Apple Notes or Evernote, but its simplicity comes in handy. When Steve Jobs introduced the iPhone as a revolutionary mobile phone, widescreen iPod and breakthrough Internet communicator, he could have added a fourth tentpole: next-generation note-taker. 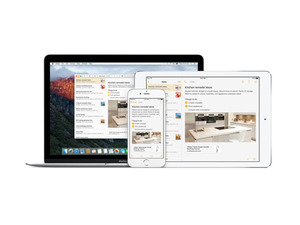 Multi-touch was a game-changer for scribblers and scribes alike, and over the years, developers and even Apple itself have packed their note apps with advanced features and powerful extensions that elevate the experience to near-desktop proportions. Dashes are used to create simple lists. Better Notes (free on the iTunes Store) harkens back to a simpler time. You won’t find tabs, sidebars or folders, but you will get a clever, speedy note-taking app that wants to be the pocket post-it of the post-paper age. And while it might not replace whichever notes app you use to store and organize your ideas, it’s a great way to quickly jot down something you don’t want to forget. 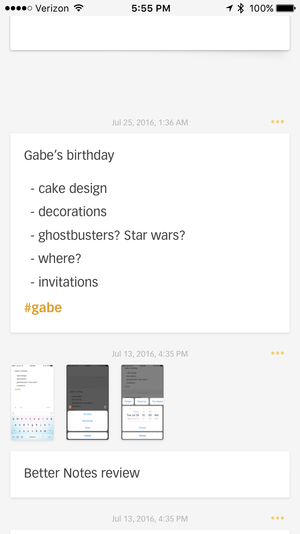 Each time you launch the app, Better Notes displays a blank white square that can be tapped to begin a new note. Text is as plain as it can be, with a Helvetica Neue-style font that can’t be resized, bolded, underlined or altered in any way. The restrictions are oddly liberating, and taking away the options gives Better Notes a natural quickness not always felt in note-taking apps. Below the blank note, you’ll see a tidy list of all of your previous musings as if they were stuck on a virtual wall. It’s a touch of skeuomorphism that surprisingly doesn’t feel kitschy or out-of-date. Notes are arranged chronologically, meaning the most recently created note will always be at the top, even if one of the earlier ones have been edited (though notes can be pinned to the top of the list by tapping the three-dot menu at the top-right of each note). Again, what seems like a limitation actually works here. 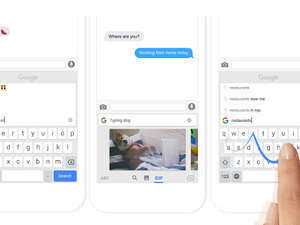 Better Notes isn’t trying to be another Evernote or even the next Byword or Drafts; its utter simplicity makes it one of the fastest note-taking apps on the iPhone, and its commitment to its vision is downright delightful. Better Notes isn’t a Markdown editor, but it does allow you use dashes to format rudimentary lists. Tapping the dash in the view mode marks the item as completed with a little check mark, and you can even schedule quick reminders by tapping the menu. You can also add and resize photos within your notes, while a system of hashtags act like tags to filter likeminded topics. Alternatively, you can search within notes by tapping the magnifying glass in the top right corner. The app doesn’t utilize iCloud or Dropbox for background syncing, but it does let you save and export a backup that can be uploaded using the share sheet. 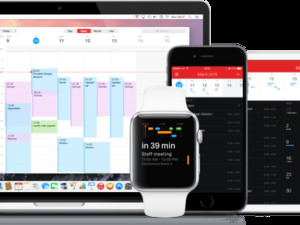 Some users will lament the lack of an iPad or Mac companion, but since it is clearly made for the iPhone, an Apple Watch app might be a better fit. But even if it just stays on the iPhone, Better Notes is a worthy addition to anyone’s home screen. Better Notes isn’t packed with features like other iOS note takers, but its drop-dead simple approach and clean interface give it a distinct charm. Better Notes won't replace Apple Notes or Evernote, but it's a great app for quickly jotting down thoughts, ideas, and checklists.